A part of your work kit when you are on the go. Idea space to carry your phone when traveling on crowded public transportation. Suitable Phone Model: Can fit for 4.7″ iPhone 6/6S/7,5.5″ iPhone 6Plus/6S Plus/7 Plus; Samsung Galaxy Note 2/3/4/5, Samsung S3/S5/S6/S7 Edge, Galaxy J3; Moto G(3rd Gen)/G4/X Pure/Droid Turbo 2/Atrix/Moto X; LG G2/G4/V10 Stylo/Optimus Pro G; HTC One Max/HTC 626 Desire/HTC One M9; Blackberry 8300; OnePlus 3; Sony Xperia Z1S/Z3/Z5; Nexus 5X/6/6P; Lumia 640/1320 phablet and so on. 1.Measure your phone before purchase. 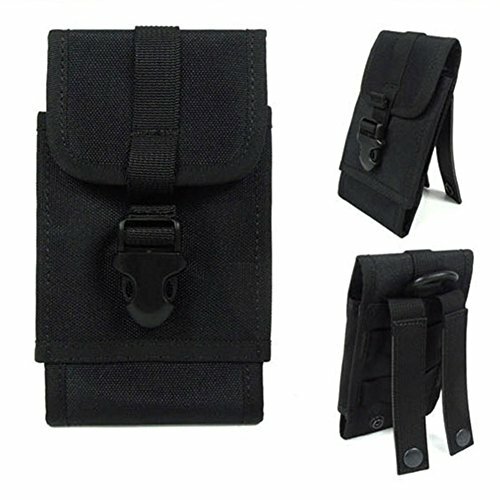 2.This Cell Phone Pouch hooked it up with the horizontal loops going under the bottom sewn-in vertical strap, weaving the horizontal strap through both sewn-in strap would make for an even more secure snap.